Find a wide variety of accommodation types available throughout Canada and it's many great destinations! Choose to visit the spectacular Niagara Falls in Ontario, Whistler in British Columbia, rated one of the world's best ski resort's, the grand masterpiece of the west - the Canadian Rockies, Victoria, Vancouver, Banff, Quebec City and much more. 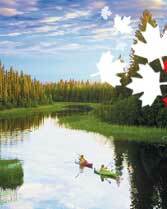 Summer, Winter, Autumn or Spring, Canada is another world waiting to be explored.. Canada's Great Destinations are calling!